We were driving through rural Kansas when we saw signs for the hand dug well. How could we not stop? The pallasite meteorite was just icing on the cake. The well has a sort of canopy over it. You actually enter through another door off to the side. 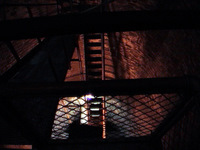 This makes perfect sense; how would you descend directly down into a huge well? 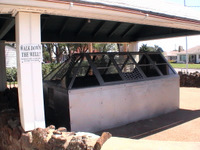 Side view of the well. 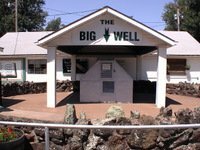 At noon on a summer weekday, there were only a few people in the area of the well and gift shop. This is a good time of day to visit any tourist attraction. 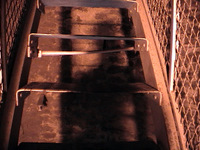 The view heading down into the earth. It was cooler, but not cold, in the well - much like Arizona's Colossal Cave, which maintains a year-round temperature of 72 degrees Fahrenheit. 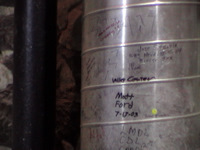 At the bottom of the hand dug well, people had scrawled their names on a pipe. Talk about a crime you can really get away with. But I'm not into that kind of thing. Standing there in the cool, dim silence, an intense feeling of solitude came over me. Much like the fountain I watched in the courtyard of a deserted seminary in Nebraska, the bottom of this well was one of the most memorable moments of our road trip. Seek out these random, unexpected moments of solitude and silence. They're the perfect contrast to crowded state parks and shopping malls. 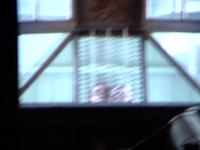 When I looked up, the surface - and my family - seemed miles away. Climbing back out. The lighting gave everything an orange hue. Don't attempt this type of climb if you have bad knees, a bad back, or are claustrophobic. 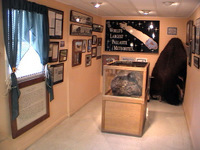 Back at sea level, a well-appointed gift shop featured the World's Largest Pallasite Meteorite (not for sale). In 2007, a tornado devastated the town of Greensburg, Kansas. The hand-dug well itself was safe, of course, because it is below ground. But the gift shop and adjacent buildings were destroyed. We hope and pray the courageous people of Greensburg continue to bounce back from this tragedy, and we are thankful we got to see the well before disaster struck.